“This house is not entirely finished, but so much of it and richly furnished that is easily to judge that when it will be done, that it shall be the compleatest, beautifullest and comodious building of any in Europe.” So wrote Sir Matthew Decker, in a manuscript now at Wilton, when he stayed with Sir Robert Walpole in the course of his tour of East Anglia in the summer of 1728. Two hundred and fifty years later, Houghton remains astonishingly complete, and, with the aid of Horace Walpole’s Aedes Walpolianae (written in 1743 and first published in 1747) and other manuscript and printed picture lists, it is easy to imagine the collection of pictures sold in 1779 back in position alongside all the pictures that were retained. However, it was only when I went round the house with the inventories taken on Sir Robert’s death in 1745, and on Horace Walpole’s inheritance as 4th Earl of Orford in 1792, that it became possible to appreciate the logic of the final concept and its unique combination of cheerful splendour and solid comfort. Fig 1. The entrance of Houghton from the north-east. The house lies almost midway between King’s Lynn and Fakenham. Both are direct expressions of Sir Robert’s personality and life, as a country gentleman of ancient lineage and a statesman honoured by his monarch – he was immensely proud to be the first commoner to be given the Order of the Garter. Houghton expresses that duality. He was determined to leave a monument to his heirs that would rival the houses of the noblest Whig families. Naturally the state rooms always receive most attention, but to appreciate the quality of the house as a whole it is essential to consider the rooms on the ground and second floors as well. The inventories show how furniture and materials were graded in accordance with the importance of the rooms, and draw attention to differences of degree in the elaboration of the architectural detail. As far as works of art were concerned, virtually all the subject pictures, which Sir Robert began to collect about 1717, were to be found in four rooms on the piano nobile, with few hung in the rooms in everyday use. Fig 2. Sir Robert Walpole’s Supper Room. One of the boldly detailed rooms, for everyday use, on the ground floor. the Country Life Annual of 1963. That so little positive change to Houghton was made between Sir Robert’s death and Horace Walpole’s inheritance was due to the straitened circumstances in which the 2nd Earl of Orford, who died in 1751, and the 3rd Earl had found themselves. Moreover, the 3rd Earl had periods of mental illness when he had to be taken away from Houghton. In 1779 came the sale of the pictures, valued at £40,555 and disposed of for £36,000 to Catherine the Great. That was followed in 1789 by the burning of the picture gallery in the north wing. Fig 3. The stone chimneypiece in the Hunting Room. It has always been the everyday dining room, with a stone floor and a moulded cornice. 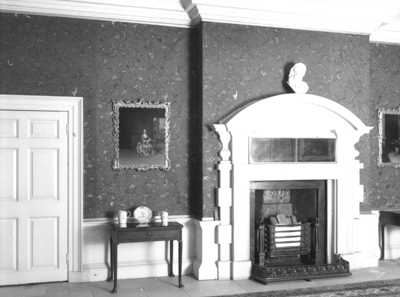 The blue ground Chinese wallpaper dates from the late 18th century; the mahogany table to the left of the chimneypiece is typical of the admirable secondary furniture in which Houghton is so rich. The sale of the pictures led to a little redecoration and the purchase from Cipriani of a set of large canvases for the saloon. Otherwise the great house limped on through Horace Walpole’s brief reign until it was inherited in 1797 by the 4th Earl of Cholmondeley, the grandson of Sir Robert’s daughter. Lord Cholmondeley did a little more decoration, largely to cope with the gaps left by the pictures, but for his 19th century successors Houghton was in the nature of an embarrassment. Indeed it was offered to the Duke of Wellington in 1816, and in 1883 there were plans to sell the whole place. Instead the house was let furnished, and that continued until 1919. Houghton came into its own once more through the marriage in 1913 of the late Marquess of Cholmondeley, then Earl of Rocksavage, to Miss Sybil Sassoon. His father gave them Houghton to live in when it became free in 1919. No house deserved, or could have received, greater good fortune than that. Happily, when Lord Rocksavage succeeded his father in 1923, his mother continued to live at Cholmondeley Castle, in Cheshire, until her death in 1938; and after the Second World War he made Cholmondeley over to his elder son, the present Marquess, on his marriage. Thus Houghton has enjoyed a period of almost 70 years under the devoted and discerning care of Lady Cholmondeley, now Dowager Marchioness, who remains as thrilled by the house today as when she first went to live there in 1919. It is thanks to her and her husband that the 1745 inventory remains such a vivid document and enables us to visualise almost all the details of Sir Robert’s creation. It started on the ground floor, which it called the Basement Storey, to the right of the south door. According to the Aedes, that was “the common approach to the house”, which explains why over it Sir Robert commemorated the facts of its building. The first room listed was the Little Parlour, the Breakfast Room written in ink on the plan in Cole’s copy of the Aedes and now called the Gun Room. It is fully panelled and has a simple marble chimneypiece, but none of the mouldings are carved. Among its contents were two tables and 13 chairs, a floor cloth, a wire window shade, and nine pictures, but no curtains. The 1792 inventory records that the chairs were walnut with leather seats. 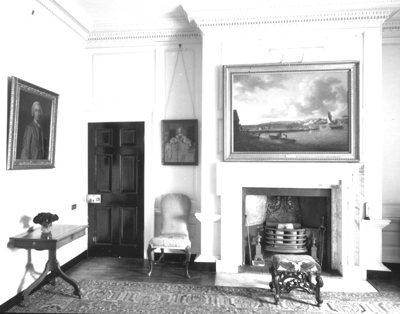 The character of the room is suggested in the overmantel picture, Hounds of Wootton. Fig 4. The main staircase at first-floor level. In 1731 Lord Hervey described it as “the gayest, cheerfulest and prettiest thing I ever saw”. Next to it, at the south-east corner of the house, was the Supper Room (Fig 2), which is also fully panelled. In 1745 it had three tables, 18 chairs, two pairs of blue window curtains, a floor cloth and 11 pictures. Nine of them were portraits of the Walpole family, and they were still there in 1901. According to the 1792 inventory the curtains were of blue damask, which may mean Norwich worsted damask, given the character of the room and Sir Robert’s practical taste (he used Norwich damask in the picture gallery); and again the chairs were walnut with leather seats. The third of these everyday eating rooms was the room in the east front still called the Hunting Room (ironically the Prayer Room in about 1900) and presumably named after two more Woottons that hung here in Sir Robert’s time (Fig 3). It has a simpler moulded cornice than those in the preceding rooms, with a stone floor and a stone fireplace; and instead of being panelled, it has a late-18th-century Chinese wallpaper above the plain dado, as if the walls were originally painted pIaster. In 1745 it had four tables, 17 chairs, and again no curtains. Fig 5. 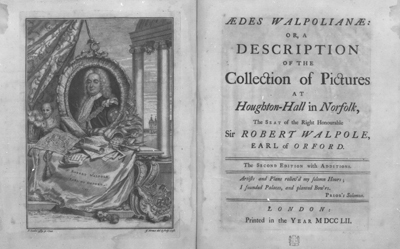 The frontispiece and title page of Horace Walpole’s Aedes Walpolianae. The first edition was published in 1747. The whole centre of the main block is devoted to a vaulted sub-hall called in the inventory the Arcade. According to Lord Hervey, writing to the Prince of Wales in July 1731, it was, “for walking and quid-nuncing”. In 1745 it contained 24 chairs, nine lanthorns, a large floor cloth, two large settees and two fire engines of Mr Newsham’s with leather pipes and two dozen firebuckets. The 1792 inventory filled that out, because, as well as including the four stags’ heads, which are still there, it listed the two settees as 8ft 6in long and 24 chairs as rail-back mahogany elbow chairs. 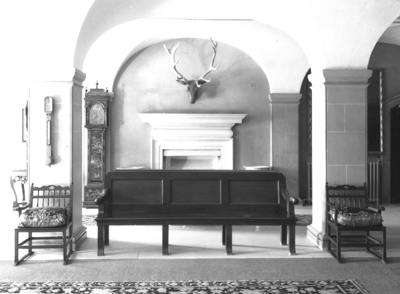 There are still 23 of those chairs as well as the settees, which are simpler than the ones in the Stone Hall and on the South Staircase (Fig 6). Fig 6. One of the original mahogany settees and two of the chairs in the arcade or lower hall. What Sir Matthew called a drawing room is the Coffee Room, as it was called in Cole’s Aedes and is still known today. It is completely panelled and the doors have shallow arched heads, as have the rooms immediately joining it to the north. The panelling has bolection mouldings reflecting the marble chimneypiece, which seems slightly old-fashioned for the mid 1720s. In 1745 it had seven tables, 22 chairs, a pier glass, a settee, four stands, a thermometer, four brass and two glass sconces, fine pictures and two pairs of blue window curtains, described as damask in 1792. The other rooms on this floor were the Plaid Room at the north-east corner, in which, according to the 1792 inventory, the 3rd Earl had died. That owed its name to the hangings of the bed and the window curtains, which were of a material found in other houses of the time, among them Belton. Although the hangings were not valuable, it was evidently considered quite an important bedroom, because it had 13 chairs in it. Beyond it were the smaller Blue Room North and the Yellow Room North as well as a bathroom, which was unfurnished in 1745. The inventory goes on to list the Stewards Parlour with three tables and 22 chairs, a Pantry and Inner Pantry. Fig 7. The Painted Taffeta Bedroom. 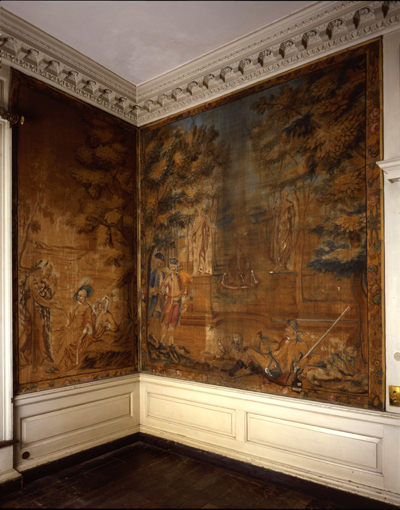 The wallhangings and the bed were listed in 1745, but the curtains are replacements. A visitor would then “ascend the Great Stair case, which is painted in Chiro Obscuro, by Kent”, as the Aedes described it, to what the inventory calls the Grand Storey and Lord Hervey described as “the floor of taste, expense, state and parade” (Fig 4). 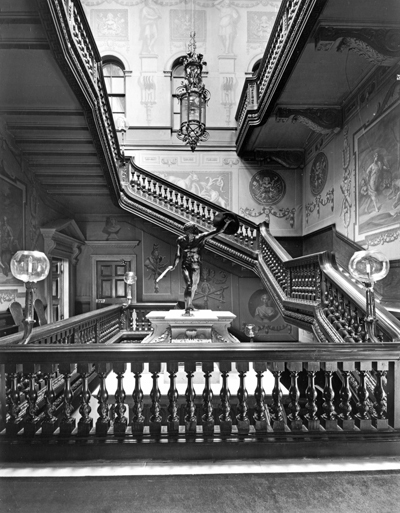 In the well of the stairs stands the dramatically mounted figure of the gladiator given to Sir Robert by the 8th Earl of Pembroke, and Sir Matthew seems to suggest that the original idea was to gild the mahogany balustrade, like the woodwork in the saloon. Although the walls are heightened with white and gold, there is no architectural colour here or on the simpler north stairs, so the continuation of the stone tones of the arcade and the hall gives the warm colours and rich textures of the rooms all the greater impact. The treatment of the Grand Storey will be discussed next week, but here we continue up to what Sir Matthew called “the atticq storye”. In 1728 it was “almost entirely finished and clean and neatly furnished; all the rooms are 14 feet high; here are twelve good handsome bedchambers, four of which are pretty large. To ten of the bedchambers is a little room for a servant which makes it all complete commodious, besides many closets for woods and other necessaries.” Decker’s description ties up with Thomas Roberts’s charge in June 1727 for two men for 55 days “fixing up all the furniture at Houghton”. It also agrees with the number in the 1745 inventory, which described eight little rooms as well as two closets, but the arrangement is not the same as that in Vitruvius Britannicus. Fig 8. Detail of a pattern of yellow damask. Part of a bedspread apparently surviving from the original decoration of the South-West Bedroom. The plan, in fact, is beautifully worked out, with the bedrooms arranged round the two staircases, without any of them actually opening off them: short corridors lead to the west-facing rooms, and longer corridors run round behind the walls of the stair wells to all the other rooms. This gives a sense of privacy, and works particularly well on the south side, which formed a self-contained unit for the family. Fig 9. A detail of “White Work India” hangings on a bed. 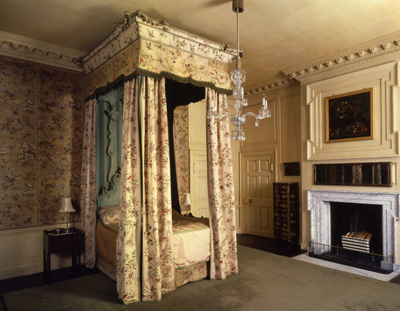 There were two such beds on the second floor in 1745. 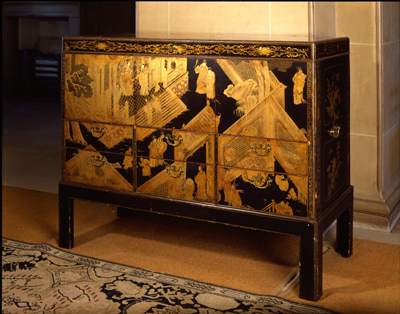 All over the house there are splendid lacquer chests (Fig 11), many of them bearing Sir Robert’s arms, but even so one of the surprises of the inventory is the strong Oriental note in many of the bedrooms. In the South East Corner Room, for instance, the bedhangings were of “work’t chintz”, presumably a chintz oversewn in a regular pattern, so that the effect was like quilting, and there were also an India chest of drawers and bookcase. The other furniture consisted of two tables, a buro, a looking glass, a stand, two settees, and eight chairs. All the four main bedrooms had that complement of chairs and settees, and so there were no fewer than 89 chairs in the 12 rooms. The South-East Corner and the Callicoe Room South Front were balanced by the Red Room and the South-West Corner Room, which was hung with tapestry and had a bed hung with yellow damask that was still there in the 1790s. The angel bed itself, possibly supplied by Thomas Roberts and one of three on this floor, has been rehung by Lord and Lady Cholmondeley , but the idea of the yellow continues in its lining, and the lower frame is still covered in yellow stuff as it was originally. Probably the original pattern of the damask survives as a bedspread which Lord and Lady Cholmondeley copied for the hangings of the drawing room below. The same pattern is recorded on a bed of which a fragment survives in the Victoria and Albert Museum. 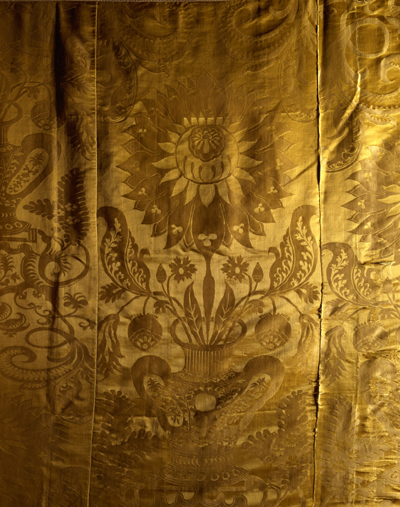 The damask is dated about 1710, and the bed is recorded in the 1719 inventory of Leeds Castle. Fig 10. Part of a set of painted toiles in the former Red Damask Bedroom. Again there was an Oriental note in that room at Houghton, because with the chairs covered in the same material went another India chest and screen. On the west front there was a second room with a White Work India bed and that had tapestry on the walls. Part of the white work may survive on two beds and Figure 9, which shows a detail from one suggests how effective the room was. On the north side of the hall and saloon, the plan was repeated with four more pairs of bedrooms. Here are two more remarkable survivors. At the north-east corner is the Painted Taffeta Room (Fig 7), which still has its original bed with pelmet cornices matching the canopy of the bed and its wallhangings. Originally there was only one window and so one cornice, whereas there are two now, and the bed itself was carefully restored for Lord and Lady Cholmondeley before the Second World War, with the green lining of of the bed being renewed at that time and the curtains being most skilfully copied. 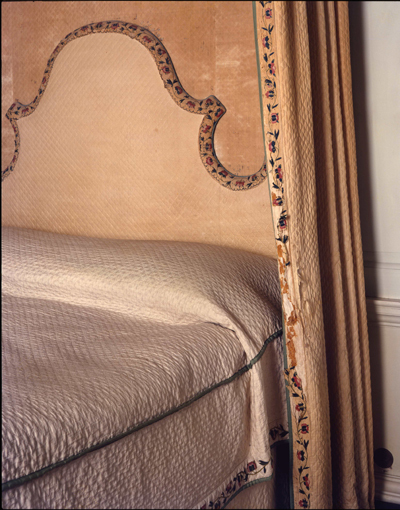 The effect of the material is marvellously light, and it suggests that there was a deliberate mixture of solemn and gay bedrooms, damask beds contrasting with those of taffeta, chintz or white work. That there was a distinction between rooms that were essentially masculine and essentially feminine is quite possible, because John Macky in his description of Wanstead in 1732 noted “My Lords” bedchamber being in crimson damask and “My Ladys” apartment in China silk. Fig 11. A lacquer chest. There are several in the house. Not surprisingly painted taffeta in situ dating from before the late 18th century is very rare, but evidently a good deal was imported, and there are also quite a number of references to the use of painted cotton and satin. The other survivor is the former Red Damask room, on the west front, so called because of its bed. In 1745 that had “painted Dimothy Hanging to the room”. It is lined with painted toils and I know of no other room in England where such a set exists (Fig 10). The north wing contained not only the picture gallery fitted up after Sir Robert gave up Downing Street, but the infirmary, the dairy, the wash-house, laundry and mangling room, the brewhouse and malt mill. In the south wing were the whole kitchen department, the servants’ hall and the housekeeper’s room and also the nursery and rooms allotted to Lord Walpole and Sir Robert’s sister, Mrs Hammond. These last are surely a fascinating comment on Sir Robert’s view of family life and how he intended Houghton to work. Photographs: 1-3, 6, 7-11 by Alex Starkey; 4-5, by Country Life.